Singer, M. Matthew, Ryan E. Carlin, Gregory J. Love, Mollie Cohen, and Amy Erica Smith “Questions of Performance: Economics, Corruption, Crime, and Life Satisfaction in the Americas” in The Political Culture of Democracy in the Americas, 2012: Towards Equality of Opportunity, eds.Mitchell A. Seligson, Amy Erica Smith, and Elizabeth Zechmeister, 2012, Vanderbilt University. This round, fundamental social, political, and ethical problem in the Americas are tackled: the tremendous gaps in opportunities experienced and resources available to the region’s citizens. While these disparities are certainly visible in differences in economic development across countries, this barometer focuses on inequalities within the countries of the Americas. For this fifth barometer round some of the asked questions were: to what extent are social and political opportunities and resources distributed equitably across social groups as defined by gender, race, and class? 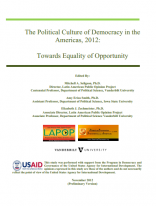 Moreover, to what extent do the citizens of the Americas hold discriminatory attitudes towards the political and economic participation of historically marginalized groups? And, to what extent do they endorse commonly proposed policies to remedy these inequalities? Finally, how do citizens’ varying opportunities and resources affect their attachment to and engagement with their political systems? Covering in total 26 countries, the fifth barometer round included opinions from more than 41,000 residents of North, Central and South America, and the Caribbean. The AmericasBarometer is used by USAID officers to prioritize funding allocation and guide program design. The surveys are frequently employed as an evaluation tool, by comparing results in specialized “oversample” areas with national trends.